The latest research report by Transparency Market Research observes that the top three players in the global neurorehabilitation devices market held a share of about 50% in 2014. St. Jude Medical, Medtronic, and Hocoma have been leading the global market with their dedicated effort to offer consumers a wide range of products that include valuable technological advancements. “Introduction of effective neurorehabilitation devices to ensure positive results has helped these players to retain their mark on the overall market,” says the leading author of this research report. 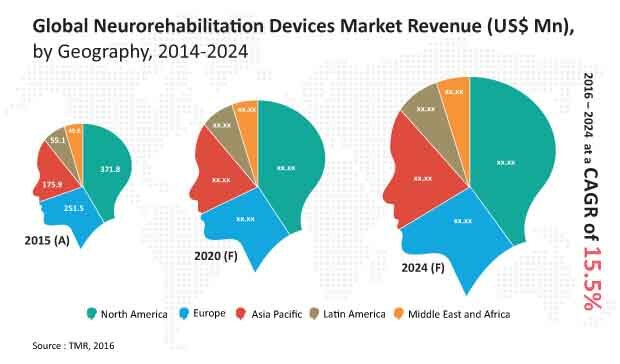 According to the research report, the neurorehabilitation devices market is anticipated to be worth US$3.2 bn by the end of 2024 from US$894.9 mn in 2015. During the years of 2016 and 2024, the global market is expected to progress at a CAGR of 15.5%. Neurorehabilitation devices for treating a stroke are expected to play a significant role in the global market in the coming years. In terms of region, the North America neurorehabilitation devices market is expected to emerge as a leading regional market. Meanwhile, Asia Pacific neurorehabilitation devices market is expected to progress at a CAGR of 17.0% over the forecast period of 2016 and 2024. The high incidence of neurological disorders has accelerated the demand for neurorehabilitation devices over the past few years. The growing investments in healthcare to ensure improved health status for overall population has catapulted the demand for these devices. The increasing number stroke cases have been predominantly been for the rise in the spending on neurorehabilitation devices. According to The Centers for Disease Control and Prevention, about 130,000 Americans meet a fatal end due to stroke every year. Thus, the high prevalence of stroke across the country is expected to keep the overall region in the forefront of the global growth. Age is a crucial component in increasing the susceptibility of the aged to stroke and other neurological disorders due to degeneration of brain cells. Thus, regions with a significant pool of geriatrics are likely to create several lucrative opportunities for the growth of neurorehabilitation devices market. Growing usage of neurorehabilitation devices in treating Parkinson’s disease has also put the market on a positive growth path. The high prevalence of Parkinson’s in countries such as the U.S., the U.K., Ireland, Finland, and Iceland have collectively made a notable contribution to the overall market. These non-invasive devices that use neurorobotic systems, brain-computer interfaces, brain stimulators, and wearable devices are also being used for treating traumatic brain injuries, spinal cord injury, and cerebral palsy amongst others. The major restraint in the global neurorehabilitation devices market is the lack of accessibility to these devices and services in the low-income groups of developing regions. Furthermore, a paucity of trained professionals for handling these medical devices to help patients in emerging economies is also acting as an impediment to the global market. Additionally, the unaffordability of neurological treatment is also likely to hamper the growth of the global market in the near future.